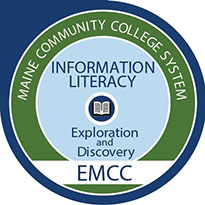 Contact Cynthia Young, cyoung@emcc.edu if you are interested in earning the Information Literacy Badge. Digital Badging provides tangible results for anyone looking to make their resume stand out. Maine’s labor shortage is affecting various fields of employment, from trade and technical, to medical professions, and more. With the cooperation of MCCS institutions and community partners, digital badging provides avenues for anyone from high school on, to complete pathways of education that can assist them in a field of study. To read more about how MCCS and the communities are facing the workforce shortage head on, read this Maine Biz article.